Fill out the form below to register for Gaming Week 2019 from July 29th - August 2nd, 2019. The total cost to attend Gaming Week is $350. We require a $100 deposit when your register. 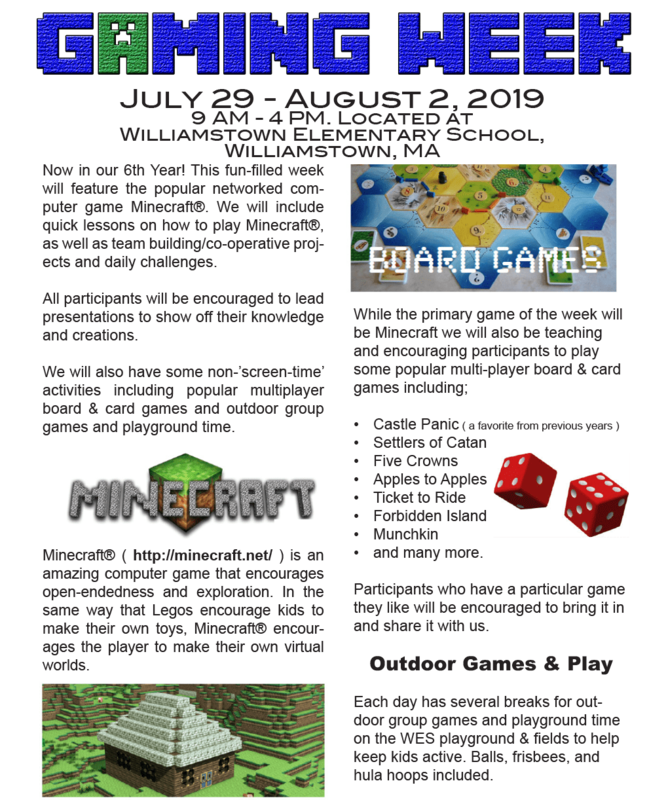 Register here for Gaming Week 2019, taking place at the Williamstown Elementary School July 29th - August 2nd, 2019. Do you have any special requirements or needs? We strongly suggest all participants have their own Minecraft account ($27 one time cost). If you don't already have one you can either sign up online at minecraft.net or you can purchase a Minecraft Prepaid gift card at Best Buy, Walmart, Target or Gamestop. If necessary we have some accounts that can be used during the week. If you already have an account and can share your username now this will assist us in preparing our server. If you need assistance in getting an account set up or getting Minecraft working on your home computer please feel free to contact us. The total cost to attend Gaming Week is $350. We require a $100 deposit in advance with the balance ($250) due the first day of Gaming Week. If you wish to pay your deposit by credit card you are welcome to pay securely here online, via Paypal or you can mail us a check. Credit card charges will show up as going to Svaha LLC of Williamstown, MA (a web hosting & design business managed by Matthew Baya). This website is secure and we will not store any of your card information after this transaction.